Outstanding students and tutors in the University of Wisconsin-Superior Student Support Services (SSS) programs were honored at the university’s annual TRiO Awards Day in the Multicultural Center in Old Main. TRiO programs at UW-Superior provide qualified students with the necessary assistance to achieve their educational goals. They include Student Support Services, which provides tutoring and assistance to qualifying students;Upward Bound, which helps high school students prepare for college;and the McNair Scholars program, which prepares first-generation college students and students from under-represented groups for graduate study. Academic Support Center Tutor of the Year – Ali Bergstrom, Superior, now a senior at UW-Superior who is majoring in Elementary Education and minoring in Early Childhood, works as a tutor for the Academic Support Center where her tutoring services are highly sought after. She has the knowledge, patience, and skills necessary to help her fellow students. Academic Support Center Student of the Year – Mualigbe Keita, who was in his first year at UW-Superior, emigrated to the U.S. about eight years ago from Guinea. As a student, he is a hard worker, and tries his best to do well in school and to complete his assignments on time. He is not shy to seek out assistance when needed. Math Lab Tutor of the Year -Tom Minor, Superior, Wis. 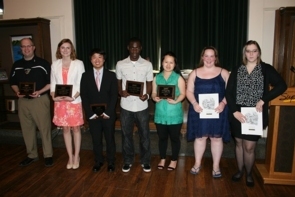 Math Lab Student of the Year – Jacob Murto, Milwaukee, Wis.
McNair Scholars Program — Scholar of the Year – Kang Her, Roberts, Wis.
McNair Scholars Program — Scholar of the Year – T.K. Vang, Stevens Point, Wis. Upward Bound Tutor of the Year – Jade Wong, Milwaukee, Wis. Upward Bound Students of the Year -Sami Lego, Poplar, Wis.
UW-Superior Foundation Gulland Scholarship Recipient – Rachel Taylor and Sara Mathias both from Superior, Wis.
TRiO Achiever Award for Outstanding Faculty and Staff – Jeff Kahler, Budget and Policy Analyst at UW-Superior. UW-Superior Chancellor Renée Wachter opened the program with a welcome and congratulated the students on their accomplishments. Josh Berlo, UMD’s Director of Intercollegiate Athletics, was the guest speaker for the TRiO Day Awards program. Wisconsin State Representative Nick Milroy, a UW-Superior alumnus, was the concluding speaker for the event. The University of Wisconsin-Superior has also been selected to receive funding through a federal grant to continue the successful Student Support Services Program, enabling the university to continue offering tutoring, remedial work, disability support services, and outreach to first-generation, low-income college students. The Student Support Services (SSS) grant from the U.S. Department of Education provides $292,340 a year for an anticipated five years. The first year of this grant award takes effect from September 2015 through August 2016. UW-Superior also contributes funds to Student Support Services. In 2015, UW-Superior was one of 25 Wisconsin universities and colleges to receive grants through the competitive process. U.S. Senator Tammy Baldwin notified UW-Superior that the school has once again been selected to receive the on-going funding. “This grant will enable us to continue to serve students and families that need support to complete their dreams of a college education,” said Toua Thao, project director, SSS, (TRiO) at UW-Superior. “Our priority is to serve students who might need an extra boost to prepare them for a quality education,” he said. Student Support Services is a federally funded program designed to serve students who are qualified according to federal income guidelines, who are first generation college students (neither parent has a baccalaureate degree), or who have a disability. UW-Superior will be able to award $33,000 in scholarships through this program. Last year, UW-Superior was awarded $292,340 and was one of 11 UW System institutions that earned a grant. Read the original article posted on July 30, 2015 here.